Drawing a map of your future garden is possibly the most fun part of garden planning! When the soil outside is cold and frozen, dreaming about how your garden will look in just a few months is incredibly satisfying. I love to get out some pencil crayons in the middle of winter and draw out a lovely garden layout map to use in the spring. Before you start drawing out your garden layout, ensure that you’ve selected your crops, decided how many plants of each crop to grow, and calculated how much area each crop will need. You won’t be able to draw an effective map without first planning your plants out properly. If you haven’t already downloaded your free garden planner, get your copy now using the form below and work through those sections. If you’d like even more guidance, I recommend the Square-Foot Gardening book. It’s available online, in bookstores, and likely at your local library. When you do have your crops selected and have calculated the required area to grow your desired number of plants, you’re ready to start mapping. The first step of mapping is to draw the perimeter of your garden. If you don’t know the exact perimeters of your garden, now is a good time to measure them. Go outside and measure your available garden space. If you don’t yet have a garden, now is a great time to plan the sizing details out. You’ll already have estimated your total available area in the garden planner, so use that as a guide. While you’re outside, take note of environmental factors such as common wind directions, shadows from other structures, the locations of large trees, and which areas get the most sun. These factors will affect where you place your plants. Your garden planner includes a handy-dandy layout mapping page. Get your planner out, along with some stationary. I usually use a ruler, pencil, thin black sharpie, and pencil crayons for the garden mapping process. Mapping out your garden begins with setting a proper scale. Since I generally follow the Square-Foot Gardening Method, I like to draw out my garden layout so that each box on my garden map represents one square foot of real garden soil. It doesn’t matter what scale you set, it just matters that you use it consistently as you make your map. You’ll have to have the real outdoor dimensions of your garden to complete this step. If you’ve not already measured your garden (or planned out where it will go), now is a good time. Once you’ve decided on a scale, it’s time to draw out the perimeters of your garden onto your map. 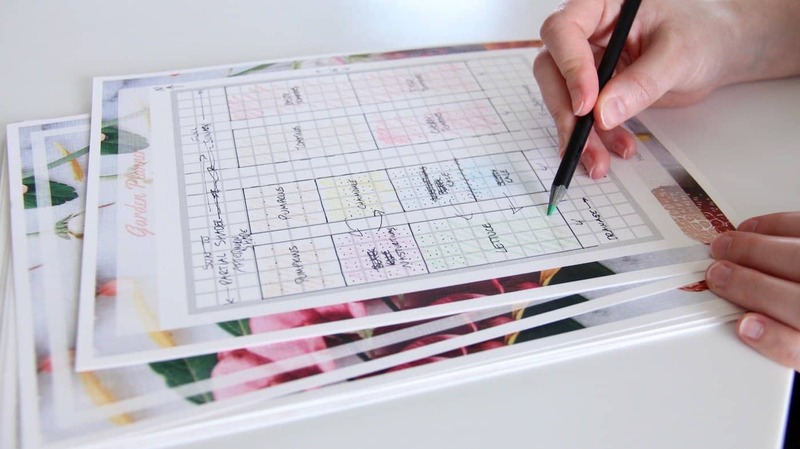 Use a pen or dark colour to draw the outside of your garden onto the mapping page (or graph paper). Write the length of each real side beside each side you draw. At this point, it’s also helpful to draw in environmental factors. This includes common wind directions, rainy or dry areas, the direction of water drainage (lowest area), the pattern of the sun, and any shadows from large structures or trees. These factors will be important as you decide which crops to place in different areas of your garden map. Now that the framework is set, you can get to work penciling in your crops. When drawing in your crops, consider each crop’s specific needs. Consult the seed packets or catalog/website from which you ordered the seeds to get the specific details. Some plants, such as salad greens, don’t need too much sun and actually prefer shade during hot afternoons. Other plants like all the sun they can get (as long as they have enough water)! Some plants like lots of water, while others are fairly drought-tolerant. Think about the unique features of your garden, and be sure to take the suggestions for each crop into account when choosing where to place things. Use the required area you’ve calculated in your garden planner to draw in the area for each crop. Use a different colour of pencil crayon for each crop to shade in the area of the garden used for that crop. Record your crop colours in the legend on the first mapping page. You can also draw a black dot for each plant if you like (especially for the plants that take up lots of room). Once you’ve drawn in the perimeter of your garden, penciled in other factors like trees, paths, and buildings, and sketched in all your crops, you’ll have a very clear idea of what your garden will look like in the spring. It will be easy to plant your crops outside now that you have a simple, easy-to-follow plan of where to plant things! If you’re just joining the garden planning process now, you can download your own garden planner using the form at the bottom of the page and get started. 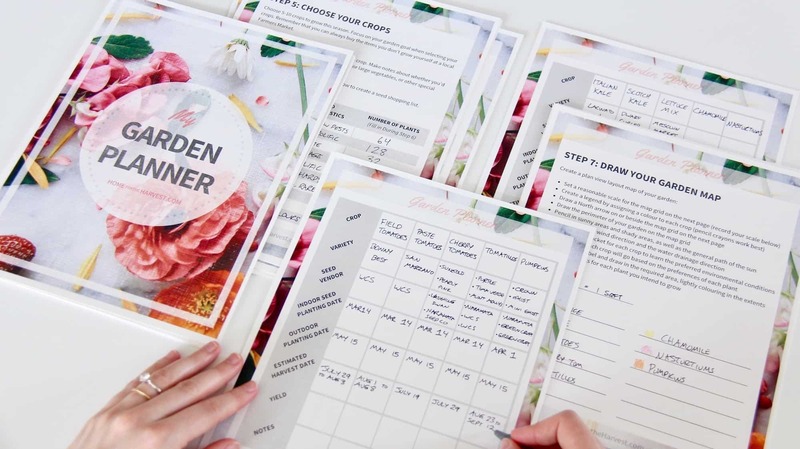 You can read more about the free planner and the garden planning process here. I added a link to this on my garden planning post for this year. It’s great! Going to get out my tape measure and follow your step by step instructions. Very excited to try this. Simple! Love it! Thanks for sharing! I do the SFG method in some of my beds, too! This is a great idea! Never thought of drawing out a garden map… definitely would make planting a whole lot easier! thanks for sharing! Those are neat printables! This is kool! I wish i had more of a green thumb. :( i want to plant a garden and some lavender. OMG!! I love your site. I have always wanted to garden but no clue how to start. I am going to go down the rabbit hole soaking up all your great tips and advice!! You’re welcome Shaylyn :) I’m glad these tips were helpful!